The deadline to enroll in the annual Equine Certified Photonic Therapy course is getting closer and closer. The Introductionary Live Call is on January 10 and Module 1 goes LIVE on January 26! The science, the benefits, dangers. Combined with other therapies? What makes a good torch session. Acupuncture points: finding the locations of all the points of the listed ailments for horses and dogs. Method of Assessment of the Equine (and Canine),…: Conformation, Balance, Reflex Reactions. 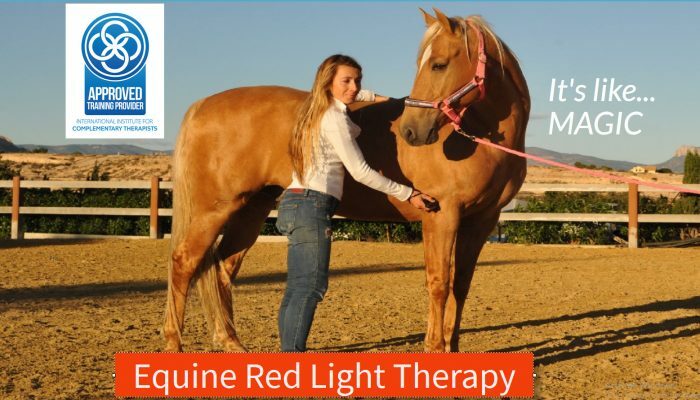 Method of Treatment of the Equine (and Canine) with Photonic Therapy. Other ways to stimulate Acupuncture points: Moxa, needles, pressure, meridian massage. Introduction in other Alternative and Complementary therapies: Aromatherapy, Acupressure, Meridian massage. Supplements on Professionalism & Etic, Safety precautions, Practicalities on the field, Record Card, Bibliography. Anatomy & physiology of the equine: skeleton, organs and soft tissues. Basics in natural behavior and safety precautions for both the tester as the testee. How to evaluate the horse’s condition, how to find out what is wrong. What you need to do to set you and the horse up for success. and what to do when they do get sick or hurt. A payment plan is of course available.